Mountains shouldnâ€™t scream, but this one did. The agony of the rock vibrated beneath the paws of a small, brown squirrel crouched low behind a boulder near the summit. The frigid night air thrummed in sympathetic harmony with the mountain, blurring the light from a shooting star trailing crimson fire across the sky. Shadows shattered and reformed, their shapes subtly altered. The squirrel sat up on its hind legs and looked to the sky, its glittering eyes following the path of the red star as it burned across the sky toward the east. Letting out a sigh, the squirrel shook its small head; no matter how many centuries you had to get ready, prophecies always caught you off guard. The Stars were returning to the world. It was a strange thought for a squirrel to have, but not for the elf-wizard that had taken squirrel form. Remaining transformed for the time being, the wizard dropped to all fours and leaped to another boulder a few feet higher up, stretching out his arms and legs to take advantage of the loose folds of fur between them. He landed on the next boulder huffing for breath. It was definitely easier to fly going downhill. He looked up to the mountain summit and shivered in spite of the fur that currently covered his body. A group of trees dotted the peak. And Iâ€™m just a squirrel, the wizard thought, rubbing his paws together for warmth before continuing his climb. The wizardâ€™s tail bushed as he scampered closer to the top. With each jump the ground felt increasingly wrong. Something was changing it from the inside, and he knew what. The roots of the trees on the summit were clawing their way deep into the heart of the mountain to feed on the rock. Until tonight, they had been contained, isolated on this mountaintop where they could be controlled, if not destroyed. The falling of the Red Star in the east signaled that was no longer the case. A power not known in the world since the beginning of time was returning. Power that could either save it, or destroy it. He concentrated on the forest, wishing he was powerful enough to wipe it from the face of the earth himself, but knowing it was far beyond him. He hoped, however, that his plan might help the one who could. All the wizard had to do was steal one small thing. And survive. Itâ€™s why he had transformed himself. A wizard going into this forest would never return. A squirrel, on the other hand, had the slimmest of chances of surviving by going unnoticed. The wizard paused again in his climb to catch his breath, watching it turn to mist and rise in the icy air, drawing his eyes to the trees that clung to the rock. No living thing should have found a home there, yet the forest survived, its roots boring ever deeper into the rock, suckling on the bitter ore it found. Leaves turned iron-black, the wind honing them to a razor edge. Bark crystallized, growing translucent to reveal the thick ichor pulsing beneath while branches withered needle thin, stabbing down at the ground in the vain search for something fleshier to consume. It was a forest, of a kind. The mountain shuddered and sent chunks of rock cartwheeling down its side, as if trying to shake the forest loose. Just in time the wizard hid in a crevice until the avalanche had passed. He poked his head up a moment later and prepared to make the final dash into the trees. It didnâ€™t look promisingâ€”arrowlike twigs splintered against rock with a sound of ringing iron as the trees now hunted among the shadows. The wizard twitched his squirrel tail twice then darted between the crystal trunks in a wild dash for the center of the forest. Branches slashed down as he dodged and scrambled for his life. Finally, out of breath and on the verge of exhaustion, he came to the very center of the forest. There, on a ragged knuckle of granite, stood a silver Wolf Oak. He knew the Wolf Oaks well, good nuts, but this one was wholly unlike the tall, majestic trees in the Great Forest of the Hyntaland on the plains below. Those trees were tall and proud, their limbs strong and supple in the nurturing sun. This tree shared none of those traits, growing low and wide across the rock, snaking its jagged limbs out in every direction to ensnare its progeny in a thicket of wild, dark hunger. Glinting, obsidian-shelled acorns covered the ground beneath it. The wizard felt the sudden urge to get off the ground and climb somewhere high. He looked at the trees around him and decided that the ground, as polluted as it was, was still preferable. It was as he feared. Being this close to the silver Wolf Oak was taking its toll; he was starting to think like a squirrel. Wolf Oaks were the natural conduits for the raw, elemental magic of nature, and among them the silvers had no equal. This one surpassed even them. Five hundred rings ago, this silver Wolf Oak had been a sapling cub in the birthing meadow of the Great Forest, a new, young life full of promise. In time, it would have towered above the tallest trees, a singular being of incredible, if simple power, ruling and protecting the forest by influencing all living things around it. It had been that way since the beginning. Then the elves had come to the Hyntaland, and everything changed. The wizard fought his most basic instinctsâ€”elf and squirrelâ€”to flee down the mountain. Not yet though, not without getting what he came for. He placed one paw in front of the other and started to move cautiously toward the silver Wolf Oak, only to find his progress stopped because the more sensible squirrel part of his mind had wedged his tail between two rocks, saving his life. Black, hoary frost sparkled on the rocks, radiating out from the tree in all directions. A moment later, a piece of night detached itself from the rest of the darkness. The Shadow Monarch, elf witch of the high, dark forest, had come. She stood beside the silver Wolf Oak, the reek of cold, metallic power filling the forest. He sensed more than saw. Her head turn and look toward him. His breath froze in his lungs, his vision darkening around the edges. Her gaze moved on. He relaxed ever so slightly, drawing in the tiniest of breaths. Frost glistened off his whiskers. The Shadow Monarch looked up to the sky, following the path of the fallen Red Star. She reached out to the tree. Anger, pain, desire, and something more infused the two, twisting the very air around them. Their madness wove together until their power was one and the same, staining everything. She then wrapped Her arms around the tree, a dark thing cradling a dark thing, and the wizard sensed what he had long feared: above all else, She wanted revenge. The wizard raised his head, peering beyond his whiskers to the black tableau a few feet away. The Shadow Monarch was looking down at a pool of ichor beside the silver Wolf Oak. The pool shimmered, revealing an image of the Great Forest to the west of the mountain. Elves of the Long Watch, formed to protect the Great Forest from Her madness, patrolled among the trees. For centuries now they had kept Her at bay, forever vigilant, keeping Her and Her forest isolated high on the mountain. It was a comforting vision. What happened next wasnâ€™t. Black flame flickered in the Great Forest, and elves and trees began to shrivel and die. Stars fell, but wherever they landed Her forest was there, devouring the Starsâ€™ power and making it Her own. New trees burst forth from the cold earth like daggers of crystal and ore. These trees spread, covering more and more ground until no free space remainedâ€¦blanketing mountain and desert, lake and ocean, in one dark forest. The mountain shuddered anew. A different image formed in the dark pool. Soldiers now stood about, their green jackets and iron muskets the unmistakable hallmarks of the Calahrian Imperial Army, the sharp edge of the human empire across the ocean. The image in the pool pulled back, revealing more. There was a small fortress on a hill, vaguely familiar to him. Power flowed from Her to the pool and the image grew larger as She searched for something there. The wizard gasped as Her magic suddenly washed over him. He struggled to keep control and remember why he was here, knowing he was slowly losing the fight as the magic of Her forest wreaked havoc with his mind. The shooting star blazed across the sky above the small fort, then stopped, hanging there like a red sun. The brilliance of its light grew until the ichor turned completely crimson. And then the light was gone and no sign of the star remained, but something had changed. Slowly, silently, he inched out of his hiding place and crept along the ground toward the thing he had come for. Every step was a cold needle in his paws, but there, just a foot away, lay one of the silver Wolf Oakâ€™s obsidian-shelled acorns. It was close, but he needed a distraction. He concentrated, trying to draw magic from the foul power that coursed around him. Wincing with pain, he sifted it in his mind until he was able to cleanse enough to perform one small spell. It would have to do. He focused his thoughts on a tree on the other side of the clearing, and for a moment it looked more like what it should have been; brown and green and healthy. The other trees attacked it at once, flailing and stabbing it in a flurry of branches. The wizard lunged, grabbing the acorn between his paws and stuffing it into his mouth. Cold lightning flashed through his head, but he managed to scamper back behind a rock before spitting the acorn out into his paws where it steamed in the air. The mountain shuddered again, a deep, mournful sound. Rock sundered. Chasms opened deep into the mountainâ€™s core, laying bare its ancient past. Flames of black frost leaped from the darkness and high into the night sky. Her forest dug ever deeper, delving more than rock, reaching back to an age long past. Primal, red-throated roars not heard for hundreds of years filled the air, and they were hungry. Another voice rose above them, and the bit of the wizard that remained in control shivered at the words. You shall feed, too, She told them. Roots pulled misshapen creatures from the depths. They spilled forth in black heaps, a shambling mass of crooked limbs and milky white eyes. Go out in this world as you once did. Gather to me those that bear my mark. Those others that would harm My realmâ€¦destroy. Every fiber in his body told him to run while his luck held, but he had to risk one last look in the pool. Like the Great Forest, tongues of frost fire were engulfing the fortress on the hill, burning everything. Her trees breached the earth, their roots clawing, searching for the star that had fallen there. Enough. He stuffed the acorn back in his mouth and ran for his life. The pain was overwhelming, but he had to get back down the mountain with his prize. Every leap took him further away from this infernal place and closer to the one who now had a chance to stop Her. When he reached the bottom of the mountain he found a nearby cave and crawled into it, spitting the acorn out and collapsing in a heap, his body transforming to that of an elf again. He let the pain and exhaustion take him, drifting into unconsciousness with the satisfaction of knowing he had succeeded in the first part of his task. When he was fully recovered he would be able to deliver the prize in person. High up on the mountain, the Shadow Monarch stood watching. She saw the elf-wizard collapse in the cave. Creatures stood beside Her, waiting. Some still bore the look of elves, though terribly twisted. They waited for the command to tear the wizard to shreds. The command did not come. Instead, the Shadow Monarch smiled. Worlds shouldnâ€™t scream, but this one would. 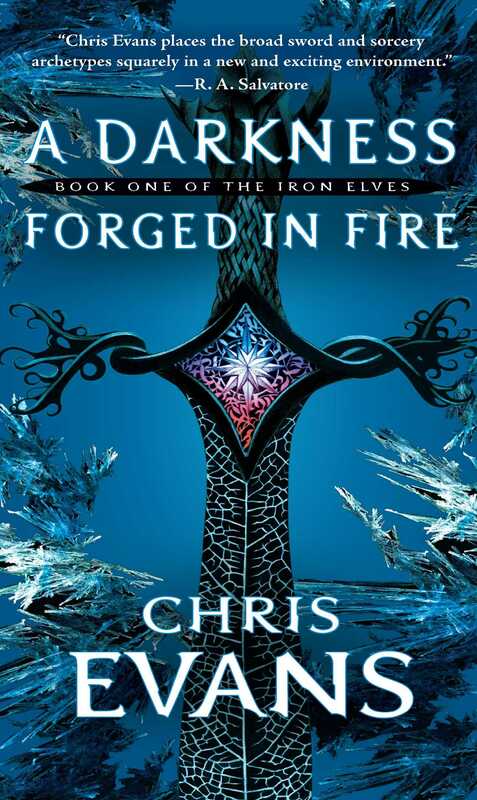 Chris Evans is also the author of the Iron Elves saga: A Darkness Forged in Fire, The Light of Burning Shadows, and Ashes of a Black Frost, as well as Of Bond and Thunder, and the nonfiction book Bloody Jungle: The War in Vietnam. He is a military historian and former editor for Random House and Stackpole Books. Born in Canada, he lives in New York City.